A killer content strategy will get your blog noticed. You will have more shares, better SEO, more comments and people will stay on your blog longer if your content is on point. A good content strategy does not happen by accident. Once you have your content strategy in place you simply use the same formula over and over again to get epic results. An editorial calendar is the perfect tool to use for your content planning. This can be as simple as writing things down in your planner or perhaps you use a scheduling service. WordPress has a plugin for an editorial calendar that you can use right on your dashboard. I’m a paper person so my editorial calendar is inside my blog planner. I use the Happy Planner Month at a Glance and Week at a Glance for all of my editorial needs. There are many different apps and sites that you can use to digitally plan out your content. If you share your content with a team, digital is the way to go with your editorial calendar. You may even want to do both paper planning and digital to get the best of both worlds. Set up your editorial calendar today for the first step in your content strategy. A great content strategy starts with a plan. Deciding how often you would like to post your content will help you stay on track. Not only do you have to decide how what content you would like to post to your blog, but how often would you like to post all of your content streams? Make a list of each place you post content and decide on how often you would like to post. Add all of those postings to your editorial calendar. To give you an idea in my blog planner the month at a glance I use for my blog posts and list emails. It’s nice to see an entire month at a glance to make sure you have all of your content planned. A week at a glance is an area of your planner that gives you more space to outline down your content strategy even further. In the week at a glance section of my blog planner I plan my posts, marketing strategy, social media, Pinterest strategy and emails. Sure it’s a lot of work planning and writing content, but when you have it all organized you can knock it right out. You can always decide what things you would like to hire out or eventually hire out. You don’t need to do everything yourself, there isn’t enough time in the day for that. How often do you plan on creating content? By making a list of all your content ideas you will have a well of content to draw from. Spend some time brainstorming ideas and then you can build your content from there. You already decided how often you would like to post content so you can get your numbers from there. If you can come up with a years worth of content it will be smooth sailing. For example, lets say you would like to post to your blog one time per week. 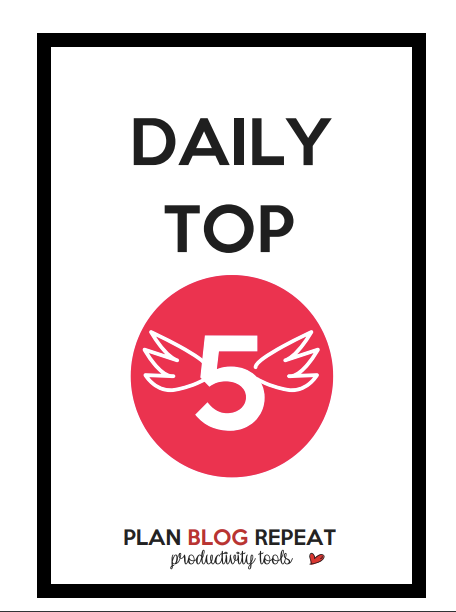 You will need 365 blog posts ideas to get a year ahead. So go ahead and brainstorm 365 ideas for content. They may not all pan out, and that is totally fine. Just get something on paper. Your great ideas can emerge from the rubble. Questions your readers ask you. Things you would like to learn. Inspiration from others that you put your own spin on. Once you have that list you can refine it further through keyword research and writing to your ideal reader. What’s the point of going through all the trouble of creating a killer content strategy if no one reads your content? If you are scrolling through any kind of feed, what makes you click? A great headline. Use power words and a great headline that describes your content perfectly. I like to get inspiration for headlines from magazines when I’m in line at the supermarket, emails, websites, ads, anywhere I see something that catches my eye I write it down. “Kill Your Belly Fat Overnight” Heck yeah I want to do that show me how! “The number one reason diets fail!” Tell me what that is so I can stop doing it!!! If you want to learn how to write great headlines with awesome examples check out this gem Yes! There Are Headline Formulas That Triple Engagement. I use a content outline for my blog posts and emails. I love using a content outline because all I have to do is fill it in using the prompts and then my content gets written like I have an assistant helping me write it. With a content outline I never forget any of the important elements that belong in my content. Clickable headline? Check! SEO Optimized? Check! Helpful to my ideal reader? Check! My content has gotten so much more consistent and easier to write since I started using my content outline. If you would like to more easily create content with an outline, now you can. My content outline has made writing content so next level that I now offer it for sale in my shop. I never forget any important elements when I write my content since I started using the content outline. Now my blog content is so highly targeted the only thing I would change is I would have started using it sooner. There are all kinds of content schedulers out there. If you use wordpress you can schedule posts right from your dashboard. You can set exactly what time and day you would like to have your content scheduled. Not only that, but you can set up social media scheduling of your blog posts from wordpress too. Tailwind is a perfect scheduler for your Pinterest Pins. You can now post directly to your facebook groups within Tailwind. Even if you schedule one pin to go to say 10 different boards for 10 different days it will only post to your facebook group once. Isn’t that fantastic? Tailwind is also perfect to schedule your Instagram Posts. With the versatility of Tailwind it’s my favorite scheduler. If you have been creating content for any length of time you have a lot of posts buried in your blog that could use a little love. You don’t need to delete those posts necessarily, but chances are the longer you have been blogging the better your writing has become. Check the headline, is it click-worthy? Is the content targeted to my ideal reader? How easy is this post to read? Are people sharing this post? Is this post SEO optimized as well as it should be? Are my images on brand? Are the pins associated with this post getting shares and repins? If I answer no to any of those questions I fix them. For example, I have a post about full-time RVing. It’s a little off topic and not exactly geared toward my ideal reader. I have that on my list to update it. How I will update that post is to not only talk about being a full-time RVer, but how that fits the lifestyle of a blogger perfectly. Think digital nomad. Once I marry two topics into that blog post voila, it is a perfect fit for my ideal reader. Perhaps with the new information I may need to turn that blog post into more than one post or a series. That’s great for my content strategy too because it will give my readers more valuable information to read once they complete the first blog post. When doing your blog post audit you can even polish up old posts and change the date and republish. Then the old content can become new again. If you write your content on demand you may end up falling flat when it comes to your deadline. If you can get your content completed for three months in advance that gives you plenty of breathing space and time to focus on other tasks. Three months in advance is a lot of content. Start out by one moth in advance. If you have completed the previous steps, creating three months of content in advance is totally doable. The number one ingredient of a content strategy is you guessed it, CONTENT. No one is born knowing how to write well. Even the most gifted of writers can get better with practice. You can set a time each day to just write. Set a specific number such as one hour or 500 words. Even if the content you are creating is for videos, you still need to write a script. If you don’t do an entire script you will need a few key points and an outline. You can do things on the fly and improv sure, but the best content is planned. The more practice something the better you get. I bet once you start doing content audits on your blog posts you will look back and be astonished at how much you have improved over time. I love a good master task list. I use one to tell me which type of content that I will be creating and scheduling each day. It all boils down to having a plan. The more you plan the better you will become. If you are overwhelmed with blogging don’t despair, you just have to get yourself on a schedule. Some people don’t like schedules while other people like me the “Type A to the Max” schedule or die. If you have a lot on your content plate use a master task list and save yourself a headache. Keep reading until the end of this post because that is where I am giving you another free blog planner insert, a Master Task List! You can print out the master task list, punch it and add it to your planner and you will no longer be wondering what you should do next. You can use it to organize your entire content strategy schedule. The last point I would like to make about content is that it should be comfortable. You are spending all this time creating a killer content strategy you need to have content that is comfortable to read, watch or listen to. Not only that but it has to deliver value. The best way to make written content comfortable is to leave a lot of white space. For more information on writing blog posts check out How to Effectively Plan and Organize Blog Posts. You can use this same formula for any content that you write. Is the content you are delivering is video? Comfortable content to watch is shot with a steady hand or a tripod. A good microphone is essential. Even if you use the microphone on your phone along with your camera that makes it so much more comfortable for your viewers. If you are podcasting be sure and use a good microphone or at the very least a headset with microphone. Leave some whitespace just like in your writing and don’t forget to pause. These are very basic tips for creating audio and video content but they are often overlooked. If you think you don’t need this information because you don’t create this kind of content you may be correct. However, who knows what the future of online content creation will be? Therefore, you may need this very type of content to have a well-rounded killer content strategy. Decide on how often you will post content. Make a list of content ideas. Use a content scheduler – such as tailwind. Audit existing content and reschedule if you would like. Write content ahead of time. Practice – schedule time to write. Use a master task list. Create comfortable content that delivers. Don’t forget to download my free Blog Planner insert the Master Task List. What problems do you have creating content? Do you have a content strategy? Let me know in the comments I would love to hear about them. Are You A Multi-Passionate? Find Out How to Make It Work For You.